Succession planning isn’t about death and taxes. It’s about maximizing the value of your business—and your wealth—through planning. It’s about ensuring your business continues to operate and grow. It’s about giving you control. The “Succession Two-Step” simplifies and separates the process into two steps: management succession and ownership succession. Doing both at the same time—management and ownership succession—usually only occurs because you have to exit the business quickly. This always results in a significant loss of value and wealth. It’s much more effective to plan ahead. Divide and conquer. 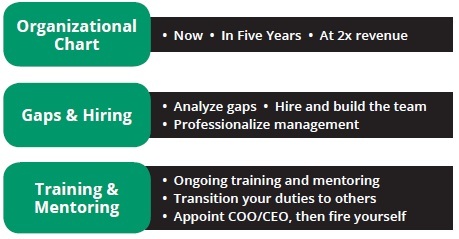 Start with management succession. The goal is to replace yourself. However, don’t appoint a single successor yet. That’s too much pressure. Build the management team and a leader will emerge. Next, write out what your organizational chart will need to look like in five years or when your company is double in size (that’s only 14 percent annual growth). Identify who on the chart will be strong contributors in the future, perhaps with training or mentoring. Identify management gaps. Then, fill the gaps with training and hiring experienced people that will strengthen your professional management team. 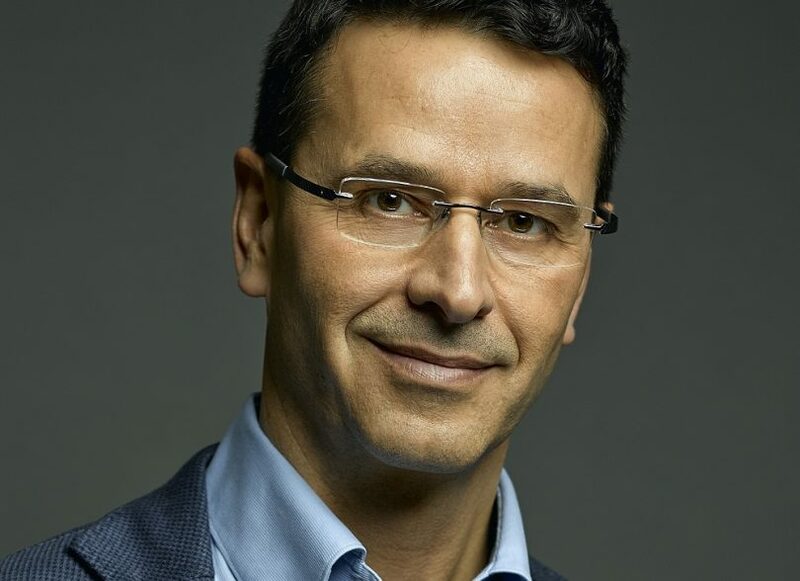 Appoint a chief operating officer that can become the next CEO. Fire yourself! Building a management team will create more growth capacity and freedom for you than anything else. If you don’t have to be there, and your team runs the business, your business is much more valuable. Ownership succession can be more complex and stressful than management succession. The structure is easy. The sale is not. 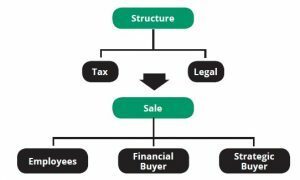 Your accountant and lawyer can develop a corporate structure that is tax efficient for exiting ownership. 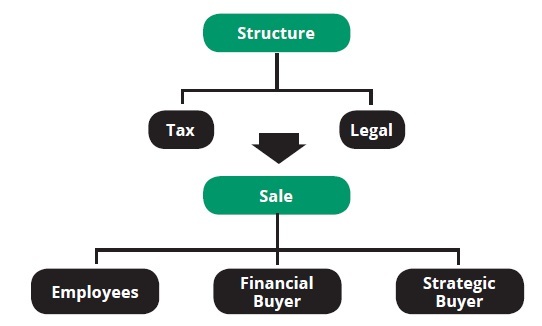 However, the most important part is facilitating a sale to employees, financial buyers or strategic buyers. An M&A expert can help you sell your business. Selling to employees may be easiest but they don’t have deep pockets. You’ll end up financing the transaction while giving up control. Financial buyers pay a multiple of earnings but don’t want to manage. You still need a management team. Selling to a strategic buyer such as larger customers or competitors can often generate the best price and quickest freedom for you but is the most work. We’ll discuss selling your business in a future issue. In summary, you don’t need to start ten years in advance. You don’t need to identify a single successor. You don’t need to sell everything. You’ve got options. Get started and keep moving. Building a management team and identifying potential exit routes is effective succession planning. Now, you control what happens and when. That’s the ultimate succession plan.